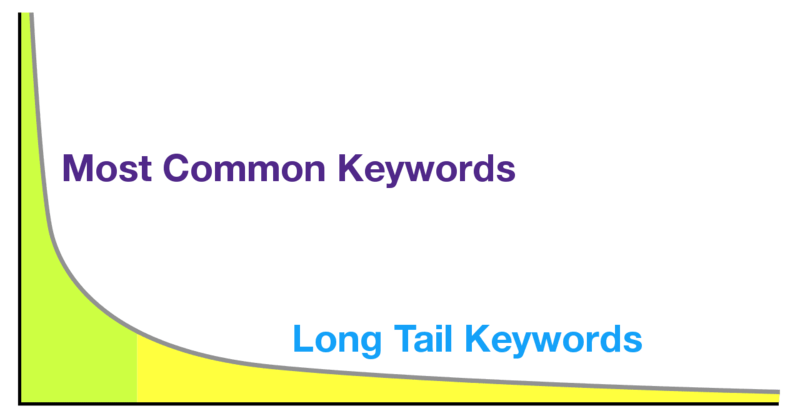 Long Tail Keywords - you have probably heard this term before. still, chances are you are probably asking yourself, “What are long tail keywords?” They are keywords or key phrases that are more specific (and sometimes longer) than the more commonly searched-for keywords. For example, "SEO" is a very general search that will net you all sorts of results, but "SEO company Kansas City" is very specific, and will direct you towards VMA (and our competitors)! Long tail keywords usually get less traffic, but will have a higher conversion value, since they are more specific to a particular topic. While you are working to set up great marketing online for your business, you really need to focus on and understand just what you are selling and to whom you are selling it. Having a clear focus for your business will make marketing it easier and get you the customer traffic you want. If you want to target the customer that knows exactly what they are looking for (and you can offer it), using long tail keywords is a great idea. But first, you need to know exactly how to use them and make the most out of it. The customer becomes aware of the product. They seek information about the product as they prepare to possibly purchase it. They will evaluate the alternatives to the product. They will make the purchase decision. They will pull out their payment method and complete the transaction. The customer will evaluate the product after buying and decide whether to keep or return it. Looking at this buying pattern, it is safe to say that as a business, you will want to really gain this customer’s attention around step 4. Sure, it's great to gain their attention earlier by using short, broad keywords, but you can also focus on long tail keywords to really get their attention when they’re making the actual purchase decision. As they are ready to buy a product, the customer will start using very specific search phrases as they seek out their target purchase. Long tail keywords are much easier to rank for, since they are specific. People who search by using these long tail keywords are more likely to become a buyer. By using long tail keywords, it is likely that you will need to create more pages within your website, as you are trying to gain a very specific audience and buyer. That is okay, because it turns out that Google likes a website that has many pages! This takes a special balance, as you build your website and those pages without adding too much junk. Be careful to not completely neglect more common keywords, or you may not gain enough traffic. It is a balance for your business that needs to be researched and see which long tail keywords have the highest traffic and go from there. It is best to have a few pages that send you large amounts of general traffic and then also have a large number of pages with each one sending you a small amount of highly targeted traffic. With SEO, it is always best to get in some good old-fashioned research as you look into using long tail keywords. This will help you determine which keywords will bring you enough traffic to sustain your business as well as help you rank higher based on the sites you are competing against. Once you have these keywords researched and ready to use, make sure that the long tail keywords are well used within all the content on your website and the pages. Content is a crucial part of making the long tail keywords work well for you. You should have better rankings. You should see higher sales conversions. More of your pages will be indexed in Google. Long tail keywords may not always work, and that is okay. It is not something you want to overuse anyway. You want these longer keywords or phrases to help push your business up, not bring it down. Sprinkle them in where you need them and figure out where to use them using trial and error. You can also simply use search engine results by looking at what Google or other sites try to auto fill when searching for your product or topic. If you want more SEO advice from Virtual Market Advantage, check out our other blogs, such this one that goes over how to best write Facebook Ads for your business!